Looking for a fun and unique way to say thank you to a large number of people? If so, then look no further than our fantastic range of retro and Corporate Sweets. From traditional jars to small party bag style gifts, we have something to suit every budget and to cater for all numbers. One of our most popular smaller options, perfect for showing staff your appreciation or a great end of project gift is our Retro Cubes and Retro Pyramids. Filled with a selection of all the greatest retro sweets from years gone by, not only is this sure to put a smile on people’s faces and satisfy a sweet tooth, but it is also sure to bring back plenty of nostalgic childhood memories which are worth just as much. From tongue tingling Fizzers to mouth wateringly chewy Refreshers, there is something to suit everyone’s tastes inside these bite-sized Perspex boxes - you can’t go wrong! What’s more, you can add your own sticker with a logo, image or thankyou message on it for an extra meaningful unique touch. Or maybe you’re looking for something that can be shared amongst the whole office? 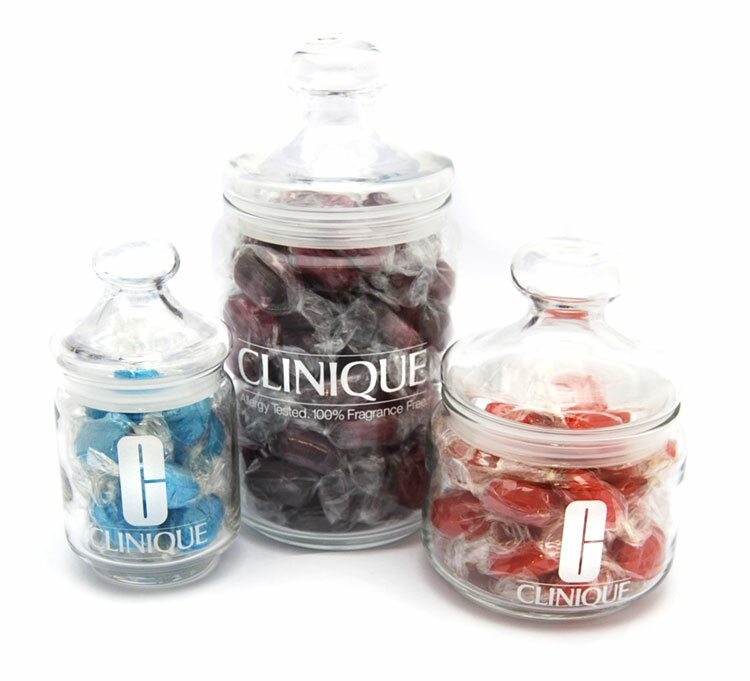 Our Branded Sweet Jars are available in a range of different sizes and the sky really is the limit when it comes to personalising these Corporate Sweets, as well as the tasty contents inside. Choose from an etched or a printed glass sweet jar or a plastic personalised jar with a branded label and then comes the fun part - choosing the sweets! Maybe you want a selection of the most popular retro sweets straight from your school days to create your very own pick and mix in the boardroom? If so, then take a look here at our brilliant range of delicious retro sweets. Or maybe you’re looking for a particular sweet or sweets to suit a particular theme or colour scheme? Here at Keep It Sweet we have plenty of options to choose from. Why not go all blue with zingy Blue Lemon Sherbets, fruity Blueberries and delicious jelly Blue Eyes? Or fill jars with Chocolate Coins, Funny Money Edible Paper and Gold Nugget Bars if you’re a financial firm? Corporate Sweets not only taste great, but give you a huge amount of freedom to create truly unique products that really are one of a kind. If you would like to find out some more information regarding our selection of Personalised Sweet Jars, or to enquire about the pricing of Branded Sweet Jars, then please get in touch today. You can get in touch using our contact form, or alternatively if you would prefer to discuss your requirements over the telephone, then please do so on 01202 486256, and a member of our friendly team will be happy to assist you. We also have hundreds of small Corporate Sweets options and promotional sweets for marketing and giveaways. 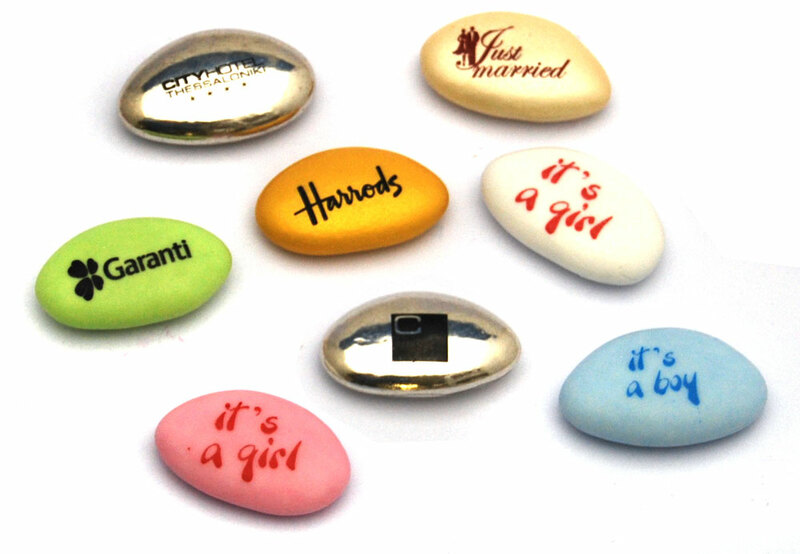 Branded Rock Sweets are a fun spin on the true British seaside classic that are sure to get people talking. This iconic sweet can be tailored to your requirements in a number of ways - choose the colours, pattern, lettering, flavour and even the label to create a marketing tool that is sure to impress customers and clients and will certainly leave a great impression of your brand or business. Printed Biscuits are another of our favourite Corporate Sweets on offer. Everyone loves a biscuit, so what better way to get your brand out there than with branded biscuits to go with the tea and coffee! With the logo printed on with delicious chocolate in great detail and available from just 18p per biscuit, you’re onto a winner with these tasty treats - you can even choose to get them individually wrapped for an extra fancy touch! Another popular product great for offering out at corporate events or for brightening up a meeting room snack table are Chocolate Dragees. Made with a 70% cocoa chocolate centre and a thin crispy sugar shell, these are just oh-so-dreamy and look too good to eat (almost!) Choose a logo or message in a font of your choice and we’ll print it on for you - all you have to do is sit back and wait for it to arrive. What’s more along with a fantastic choice of colours, you can even choose metallic gold, silver or champagne colours that are immediately eye-catching and sure to get people’s attention and leave a lasting memory. We also have plenty of other Corporate Sweets available from Chocolate Nets to Branded Logo Lollies, alongside other products including Branded Party Bags and sweets for films, exhibitions and any other events - no idea is too unusual! View our full selection of Corporate Sweets here and please don’t hesitate to get in contact with any queries or questions.